The first time we went to the cinema with the youngest was to watch Alvin and the Chipmunks - The Roadchip with our friends as a birthday outing. I wondered how she would be as didn't want her to ruin the day for the birthday boy but she loved it, I think the choice of film and tub full of sweets was the winning combination. Sine then we have been Alvin and the Chipmunks fans, and of course with constant access through Netflix of the film it is a firm favourite for every movie night. Netflix have also released a new series so we can have some variety of the talented trio! When we offered to review the Alvin and Chipmunks 100 piece puzzle I wouldn't be forgiven if I had said no. 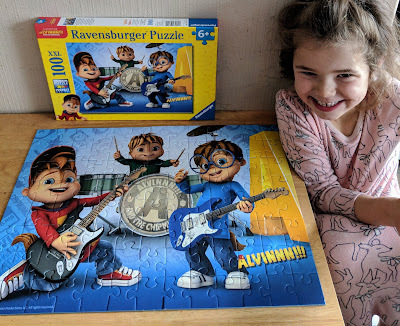 We are going through a stage with both kids at the moment where they are enjoying doing puzzles more than playing games which is great for them developing their problem solving skills. The puzzle is aimed at age 6+ and the size of the pieces are a perfect size for this age, the pieces are strong and will withstand plenty of use as I am sure this will be pulled out to make up over and over. 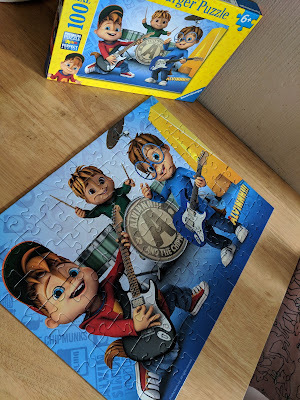 We sat and made the puzzle up together but the youngest at 6 was capable and managed without too much help. 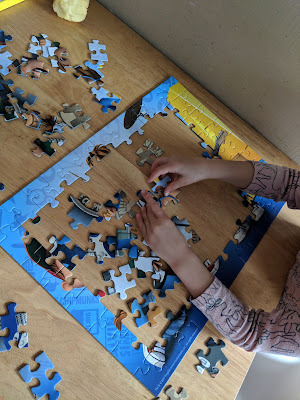 I think taking time to sit and do things like this is really beneficial for both the kids and us as parents, often we have such busy lives we are pre-occupied with a list of jobs or places to go so the kids fall into the habit of turning to screen time. It is surprising what comes up in conversation when you are sat doing puzzles or playing games with the kids as we giving our attention 100%, often we can be present but 'absent' when talking over the TV, games consoles, or just doing every day jobs.